FILE - Thai policemen arrange packages of methamphetamine on a table before a press conference in Bangkok, Thailand, Feb. 15, 2013. The United Nations, alarmed by a rise in amphetamine trafficking across Asia, is calling for Australia to play a larger role in combating the trade. Officials say a surge in the production of amphetamine-type stimulants (ATS) has been evident in recent years even as trafficking of heroin, produced in the Golden Triangle region of eastern Myanmar, continues to flourish. In 2015, the United Nations Office on Drugs and Crime (UNODC) reported seizures totaling 27,000 kilograms of highly addictive crystal methamphetamine – known as crystal meth or ‘ice’ – across Cambodia, China, Laos, Myanmar, Thailand and Vietnam. At the same time seizures of methamphetamine tablets totaled 286 million pills, while heroin produced from poppy cultivation in eastern Myanmar was over 10,000 kilograms. Seizures of chemicals vital to the production of such drugs are also up. “This is a big, big concern – it’s really flooding the region at the moment. Its highly addictive crystal meth. This is the big concern not just in Australian law enforcement, but New Zealand law enforcement, North American law enforcement are paying close attention to these developments,” Douglas told VOA. Australia and New Zealand are key targets of the syndicates due to the countries’ high incomes and drug usage rates. 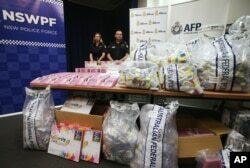 Since late 2015 Australia’s Federal Police (AFP) have signed agreements with China and Thailand to boost cooperation against the trafficking of drugs into Australia. FILE - Australia Methylamphetamine: Officers stand by a display of confiscated drugs in Sydney, Monday, Jan. 15, 2016. The agreement with China linked the AFP with the Chinese National Narcotics Control Commission (NNCC), China’s anti-smuggling bureau (ASB) and the Guangdong Public Security Bureau (GPSB). A similar task force agreement with Thailand’s anti-money laundering authority and narcotics control agencies is code-named Task Force Storm. “What we’re seeing increasingly are threats emanating from various countries that impact on Australia. So it’s in our interests to work regionally to help secure the region but also that has incredible domestic impact as well." Thai narcotics officials and the UNODC say Australia's operational experience in combating drug smuggling can benefit its neighbors in the Association of South East Asian Nations. Officials point out that increased trade and looserborder restrictions under the ASEAN Economic Community create opportunities for organized crime to move drugs and precursor chemicals more easily across borders. Rachanikorn said a China-initiated program for the Mekong region has already fostered growing cooperation within among Cambodia, China, Laos, Myanmar, Thailand and Vietnam. UNODC’s Douglas agrees Australian law enforcement could play a larger role in supporting the region’s efforts to combat drug trafficking. He said U.N. support can help overcome any political obstacles that may arise. “The agreement that Thailand and Australia ventured into is really great. We encourage that kind of agreement. But it really needs to involve many, many countries at one time,” he said.